U.S. Special Representative for Ukraine Kurt Volker says Russia needs to release the Ukrainian sailors taken captive in the Kerch Strait in late November by Christmas or "before the new year." Volker spoke with VOA on Monday in Washington, explaining that the United States and its Western allies are considering a number of options to prevent Russia from asserting any more "unilateral control" in the shared waters of the Azov Sea. 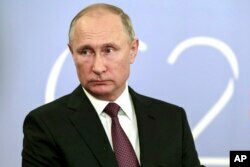 "We don't accept and will not accept Russia's claimed annexation of Crimea," he said, underlining the stance that the United States has taken since Russia's so-called annexation of eastern Ukraine's Crimean Peninsula in 2014. Noting that the waters of the Azov Sea are subject to a bilateral arrangement between Ukraine and Russia, he said, "We don't accept that the territorial waters around Crimea are Russian. They are Ukrainian. We don't accept, therefore, that Kerch Strait is completely Russian. We believe it is shared sovereignty." The damage on one of three Ukrainian ships is seen after it had been seized, Nov. 25, 2018, in Kerch, Crimea. 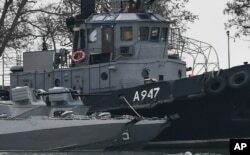 He said Russia's actions in the Nov. 25 confrontation, when it fired on and eventually seized three Ukrainian navy ships attempting to pass from the Black Sea into the Sea of Azov through the Kerch Strait, are "a clear violation of international law and violation of bilateral agreement with Ukraine." He said the United States insists that Russia return the ships and the 24 Ukrainian soldiers and intelligence agents arrested by Russian security agents. Volker said the United States' European allies could move to bar Russian vessels coming from Crimea or the Azov Sea from European ports. He said the move was suggested recently by Annegret Kramp-Karrenabaue, general secretary of Germany's ruling Christian Democratic Union and an aspiring successor to outgoing German Chancellor Angela Merkel. "It is a very strong measure and a very creative one," Volker told VOA. "We'll see if they pursue it." He said the United States wants such measures to put pressure on Russia and "get to the point at which Russia is willing to negotiate a solution." The Swift bank logo is pictured in this photo illustration taken April 26, 2016. When asked about cutting Russian banks from SWIFT - a measure which is being floated for some time by an expert community, Volker hasn`t ruled it out. "People refer to it as a nuclear option. It would have costs for everybody involved. Big costs for Russia, but big costs for allies as well. Ultimately, we have to keep it on the table as a possibility because we just can't continue to see Russia launch further steps of aggression in its neighborhood like this." 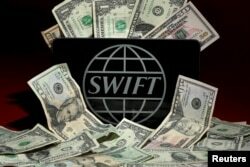 SWIFT is an international banking network, which operates under Belgian law and facilitates international transactions by sending payment orders between institutions in different countries. Volker also said the cancellation of a scheduled meeting between U.S. President Donald Trump and Russian President Vladimir Putin during a G-20 summit in Buenos Aires was "appropriate" to convey to Russia that the United States is concerned about the Azov Sea incident "at the highest level." "They are very serious about it," Volker said. But he said the Ukrainian people have developed a much stronger sense of skepticism toward Russia since its actions on Crimea — "invasion and occupation and killing Ukrainians." Volker also commended the Ukrainian navy captains and sailors involved in the Kerch Strait incident for their restraint. "They did not fire back," he said. "They were trying to avoid the conflict and act responsibly." For Russia's part, Volker said it would be "extremely reckless" for Russia to take even more aggressive action in Ukraine. "The Ukrainian military is much more capable than before," he said. "It would be a much more costly exercise. They would lose any shred of deniability that they still cling to now, and Ukraine would gain a lot of support" from NATO, the United States and the European Union. 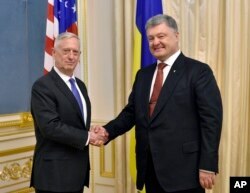 Ukrainian President, Petro Poroshenko, right, and U.S. Defense Secretary James Mattis shake hands during a meeting in Kyiv, Ukraine, Aug. 24, 2017. Asked about plans to visit Ukraine, Volker said he hopes to visit before the end of the year. He said he would like to meet with Ukrainian President Petro Poroshenko, meet members of parliament and civil society, and perhaps visit one of Ukraine's ports.